The timing of an email from my local clean air agency was uncanny. At the very moment I had lit my first fire in weeks the atmosphere turned on me. From the eerie stillness in the air that hung around our back porch, the too-strong fragrance of my barely burning fire, and the layered fabric of clouds in the sky, I knew already what that email said. Burn ban – no outdoor fires. Drat, drat and double drat! With a heavy heart I put the metal door back in place and let the fire die. This is the 3rd fire made in pulsing the oven. The plywood, protecting the cold floor from thermal shock, is being consumed by the coals. You have to understand. See, four weeks is about as long as I can stand without a fire in my outdoor oven. After that, weird things begin to happen to it. Masonry inside the fire box, normally insulated by a good 10 degrees or more, chills to air temperature. More slowly the humidity creeps in – absorbed from the air and wicked from the ground. From the oven’s legs, which in the dampness of winter are veined with algae, my active brain can imagine a great sponge of damaging moisture on the move. A thermal shock could break something if I’m too hasty in firing the oven under such conditions. And truth be told, after too long I just plain miss the comfort of the glowing fire! So the other day, when a warm breeze blew in from the south and scrubbed away our cold air, I chopped some kindling and got out the matches. Whistling a jaunty tune, I cut a piece of plywood 2 feet square and centered it on the floor of my oven. Then I started a small fire on it, made a batch of pizza dough and called my friends. By the time our friends arrived, the oven was back to its old self, and mostly so was I. 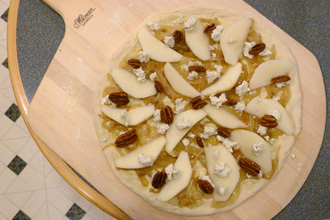 But one further creation of my active brain squirmed to life that evening: Pear Pecan Pizza. 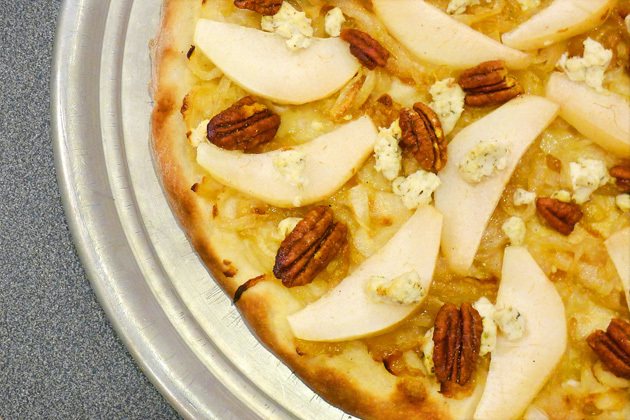 Made on a bed of caramelized onion and topped with pear slices, pecans and herbed chevre cheese, it’s the closest thing to a dessert pizza we’ve had here at Chez Bullhog. And by all accounts, it’s a winner! In a large bowl, dry mix 2 ¼ cups all-purpose flour + 2 ¼ cups caputo flour (or 4 ½ cups a.p. flour if caputo is unavailable) with 2 ½ teaspoons salt and 2 Tablespoons of sugar. Make a dip in the center of the flour mix and put in 2 teaspoons of active dry yeast. Measure 1 7/8 cups of 100° water. Add about ½ cup of this water to the yeast and let sit for 5 minutes to hydrate. Now add the rest of the water and incorporate fully with the flour, scraping the sides as necessary. Knead on a floured surface for at least 10 minutes. Put the dough back into the bowl, cover lightly with plastic and let sit for 5 or 6 hours in a cool place (60°), punching down if necessary. Knead again at this point, and return to the bowl for another 2 to 3 hours, this time at room temperature (70°). When the dough is puffy and the oven is heating up, divide dough into 8 ounce pieces for 12” pizzas or 10 ounce for 14”. Let rest until you’re ready to make pizzas. Caramelize the onion: Remove skin and ends from the onion and slice the onion thinly. Over medium-high heat, sauté onion in 1 Tablespoon butter and 1 Tablespoon oil for a few minutes until beginning to brown. Turn burner to its lowest setting and let onion simmer for an hour, turning occasionally until translucent. 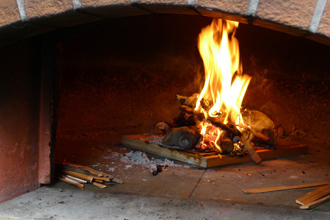 Get your oven good and hot: If you have a woodfired oven, the fire should be at least 2 hours old (after pulsing) and the ash on the sides and top should all be white. Move the fire to the back and sweep the floor well before firing your pizza. In a conventional oven, heat a pizza stone or quarry tiles on the middle rack for at least ½ hour at 450º. Make the dough blank: Stretch 8 ounces of dough into a 12” round. Do this in increments, to allow the gluten to relax during the process – six or eight inches, then 10 and finally to 12”. Leave some air in the dough for best results. When fully stretched, put the dough blank on a lightly floured peel or on the back of a cookie sheet sprinkled with corn meal. Assemble the pizza: Make sure your dough blank can ‘slip’ on the peel or cookie sheet. Drizzle 1 Tablespoon of olive oil onto the dough, leaving the edge dry. Spread a thin layer of caramelized onion. Now put on the pear slices and pecan halves and dot the whole thing with pieces of herbed chevre. 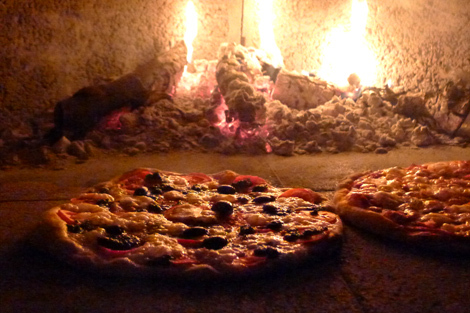 Bake your pizza: Slip pizza directly onto the quarry tiles in a conventional oven or onto the floor of a woodfired oven. In a hot woodfired oven, the pizza will take 5 or 6 minutes; it will take 8-10 minutes to bake in a conventional oven preheated to 450°. Turn pizza at least once during baking. When onion glistens with bubbles and the crust is medium brown, remove to a pizza pan. Slice, serve and watch the smiles grow around the table! This recipe springboards off a pizza that my friend Bill from Woodfiredpizza.org made for me last summer. His pizza, caramelized onion and walnut, has had me looking at pizza in a new light ever since. Thanks, Bill, and Flame On! Oooooh a pizza with nuts and fruits…wow! I’m impressed! I’ve been begging for an outdoor oven for years now, but some rules/laws of the neighborhood won’t allow it … whatever! Oh, this just looks amazing! I bet it would be great with some fresh argula on top! I’m sorry they banned your outdoor fireplace! Hopefully the ban will be lifted soon so you can enjoy it again! Your pizza looks amazing so I hope you found some comfort in that! This sounds absolutely amazing! I love sweet pizzas, and those ingredients are some of my faves. Oh, no worries Christina. A burn ban is a temporary situation that comes and goes with the weather. I was able to use the oven again after only 4 or 5 days. Thanks for your concern! Wow! Knowing nothing about the workings of WFO’s this was an education! The pizza looks amazing too! Have you ever done a pizza with plantain, goat cheese, and cashews? I had one years ago and have been thinking about it a lot lately! Pizza looks amazing! I am jealous of your outdoor oven. It is too cold to even BBQ right now, I fear what the cold would do to wood fire oven! OMG this is really cool..
Pecans in pizza!!! Would love to taste one of this pizza! Very interesting! I love cool new ways to make pizza. Love everything about this one…the savoriness of the cheese, the earthy crunchiness of the nuts, and of course the sweetness of the pears. Lovely. I have a pizza stone which is the best I can do in a condo but the flavours here are a marriage made in heaven Don. It’s so mouth watering actually, great recipe Don , actually I have a question that I’ve wanted to ask every time I read a post on your blog and see your profile picture, where were you on that camel? Oh, how I’d love to have an oven like that!! Looks like a great dish – never would I have thought to put that on a pizza but it sounds wonderful! Thanks for sharing. What a fabulous combination. Inspiring. I’ve been making pizza every week to improve my technique, and this is going on the list. I am deeply envious of your oven! Wonderful combination of flavors…onion and pear…yum! Oh, I love anything with pears, but had never imagined pizza! I bet it’s awfully tasty with the chevre and pecans! Love the idea of this sweet pizza! I am rather envious of your outdoor fire. It looks like it would be a blast to work with. The pear pizza also sounds like such a great idea! In the absence of an outdoor pizza oven (not bitter)! I may have to use these ingredients in a salad. I just bought some local Andalucian hard goat’s cheese which I think would be perfect with the pears & walnuts(no pecans here). I’m thinking a rosemary honey dressing, what do you think?